If you wish to enjoy the treasures of Naples in a professionally redecorated four bedroom home - then you have found your vacation paradise. 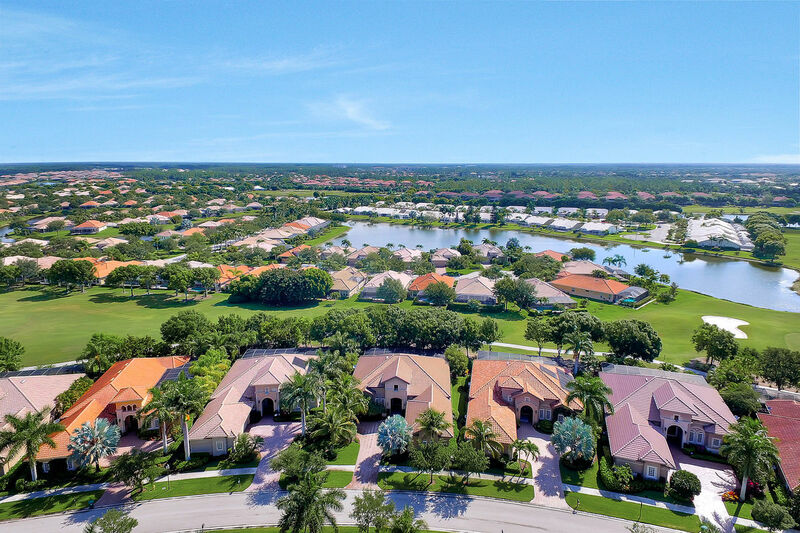 Located in the private (double gated) and exclusive Majors community in Lely Resort, this beautifully appointed open floor plan features high ceilings, crown molding, granite counters, an outdoor kitchen, and luxury upgrades throughout. Completely redone in summer 2014 - this home is like new and features recent updates throughout - including new furnishings, fresh paint, and new plush carpeting. Even the bikes, board games, linens, children’s toys and beach chairs are new – making your vacation enjoyable and completely hassle free. 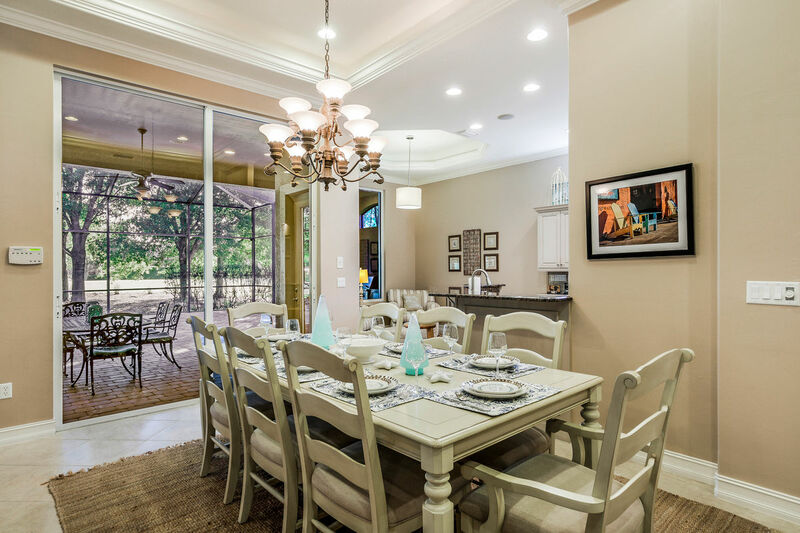 A fully updated and re-stocked kitchen with new plate-ware, flatware, cookware and utensils will make those stay-in dinners truly special. 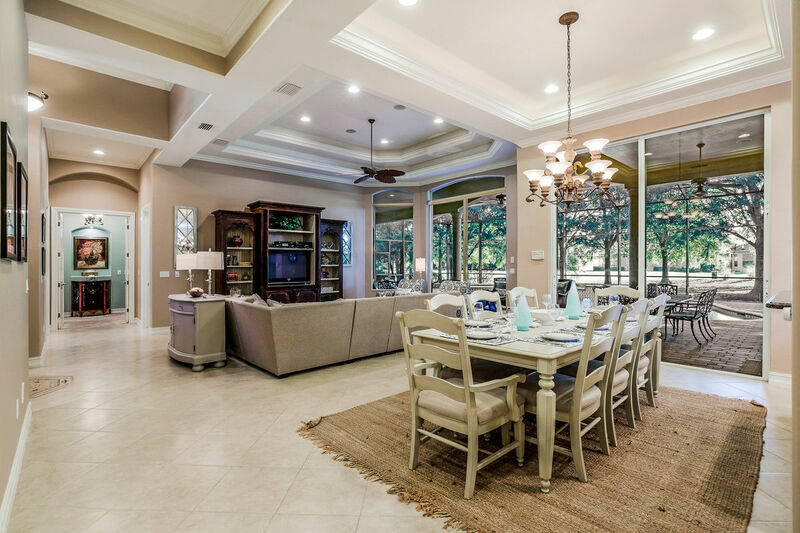 This luxurious home sits on the Mustang Golf Course at Lely Resort Golf and Country Club and affords 4,000 square feet of total living space. 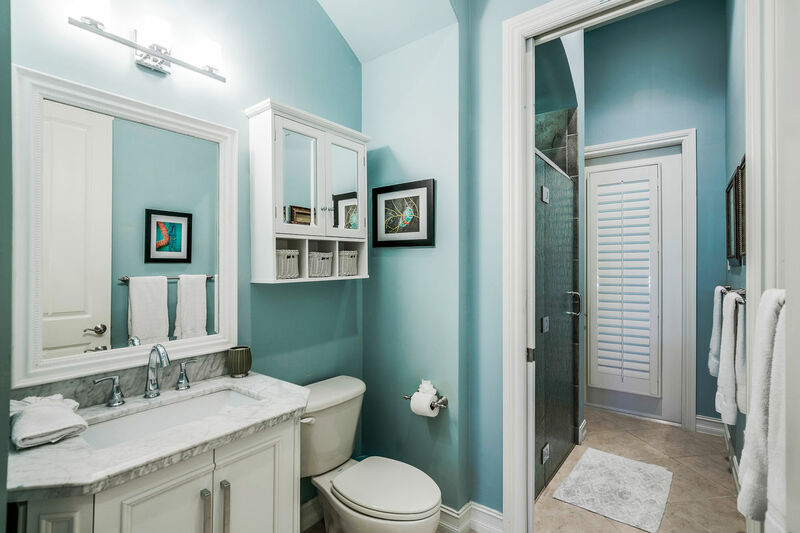 The floor plan consists of a beautiful master bedroom, three guest rooms, three luxurious full baths, a laundry room, a three car garage and a spacious lanai. 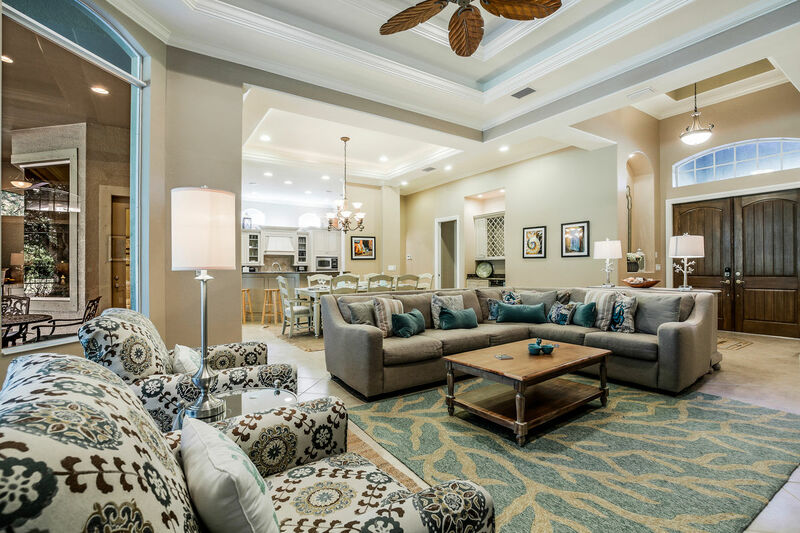 Relax in comfort in this roomy home, which features an open floor plan outfitted with new luxurious - yet comfortable - furniture. 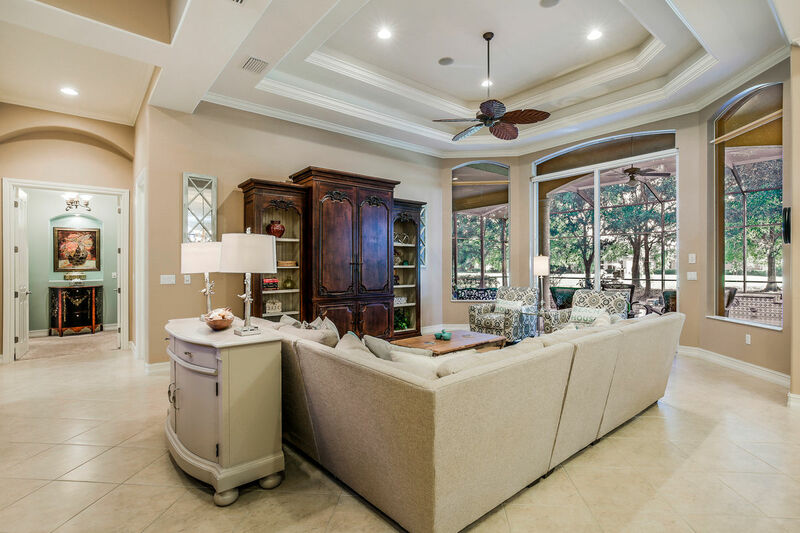 The great room offers vaulted ceilings and opens onto a screened lanai with a private pool and spa. 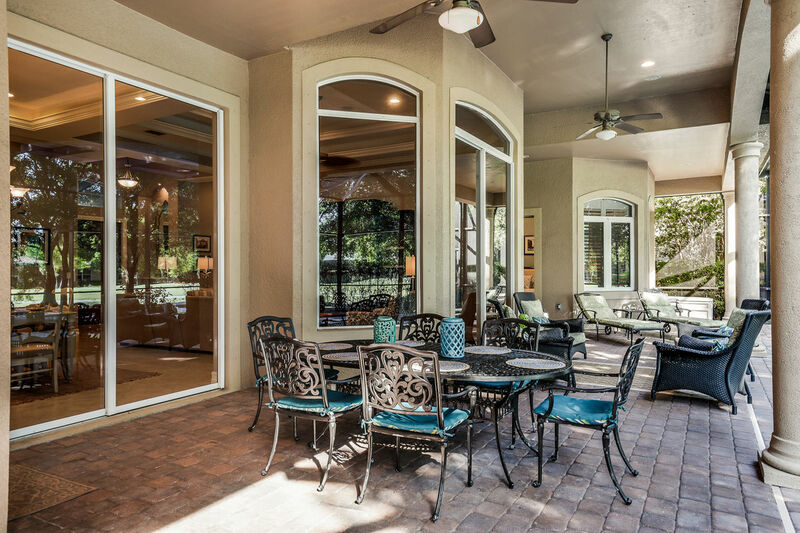 There is an outdoor kitchen area for entertaining and enjoying afternoon cocktails. The waterfall will be very soothing. 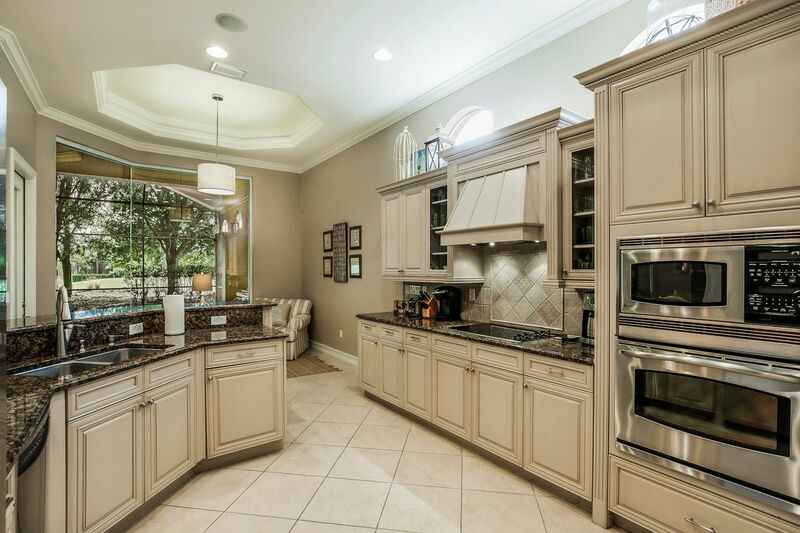 The indoor kitchen is fully equipped and would impress a gourmet. There is a dry bar with a built in wine cooler. 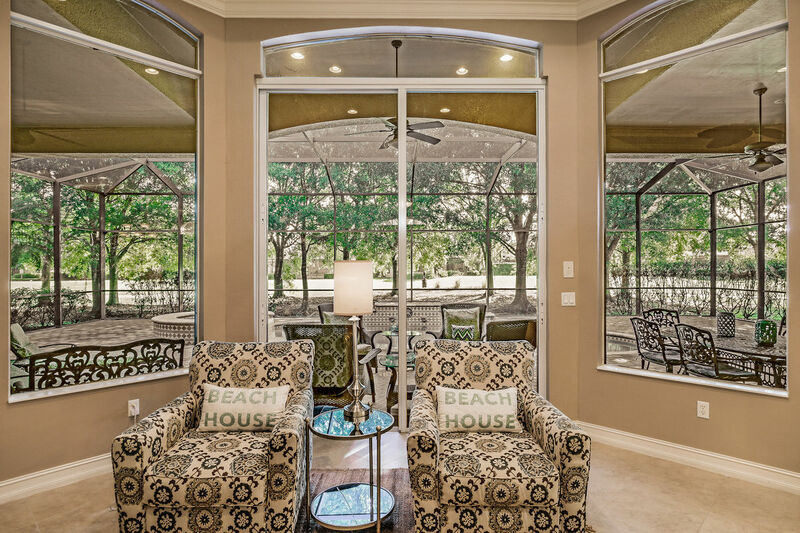 Enjoy your morning coffee in the comfort of a newly designed sitting room off the kitchen. 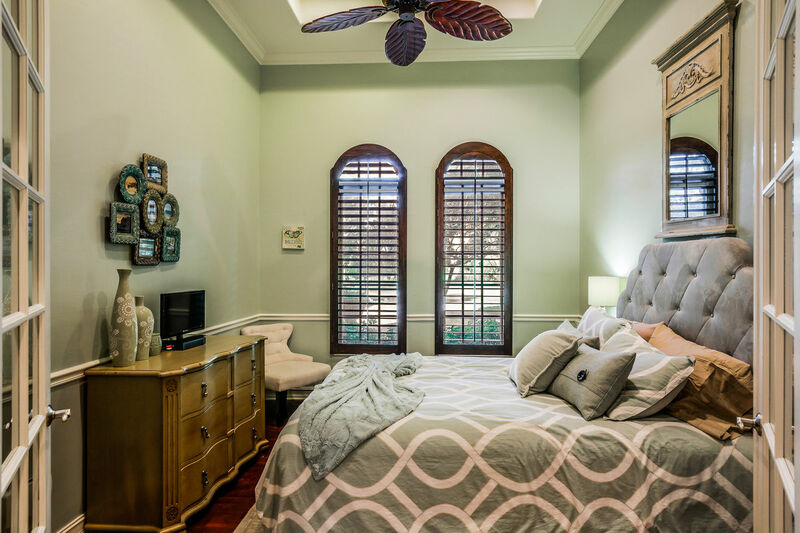 The master bedroom has a large walk-in closet, a plasma TV and has private access to the lanai. 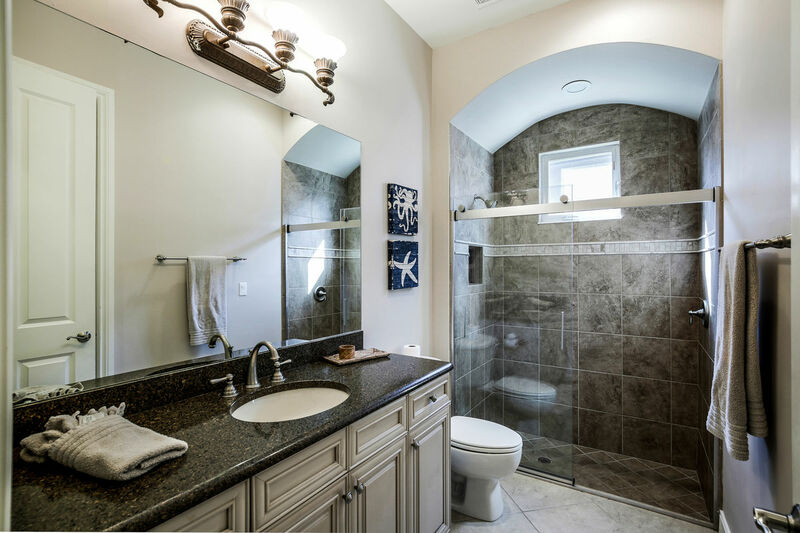 The master bathroom contains a spacious roman tub with whirlpool jets and a separate walk-in shower with wall to wall tile. 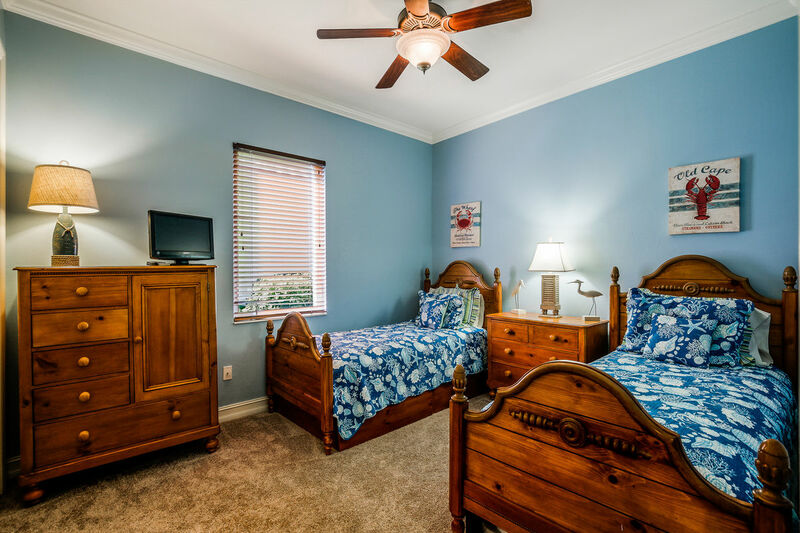 Two guest bedrooms contain queen size beds, and a third guest bedroom features two twin beds (one with pull out trundle). In addition you will find one deluxe inflatable twin-size bed in the closet of the kids room (twins size bedroom). All guest bedrooms include flat panel TVs. 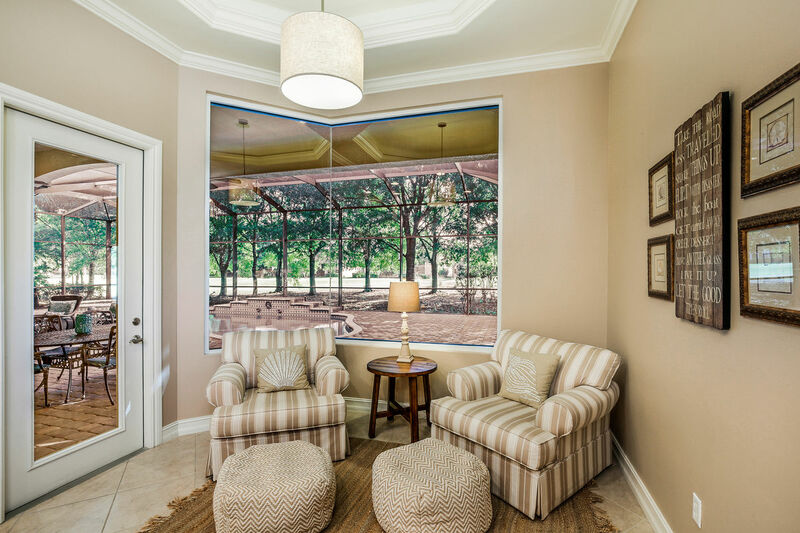 The multimedia center allows audio from music sources, television and video to be played in the indoor living areas and also outside on the lanai. In the garage you will find for your convenience bicycles, four adult tennis racquets, beach equipment and a full size Pink Pong table and paddles. Enjoy a game of Ping Pong in the garage or feel free to move the table (it has wheels) to the lanai area and enjoy playing in the sunshine. 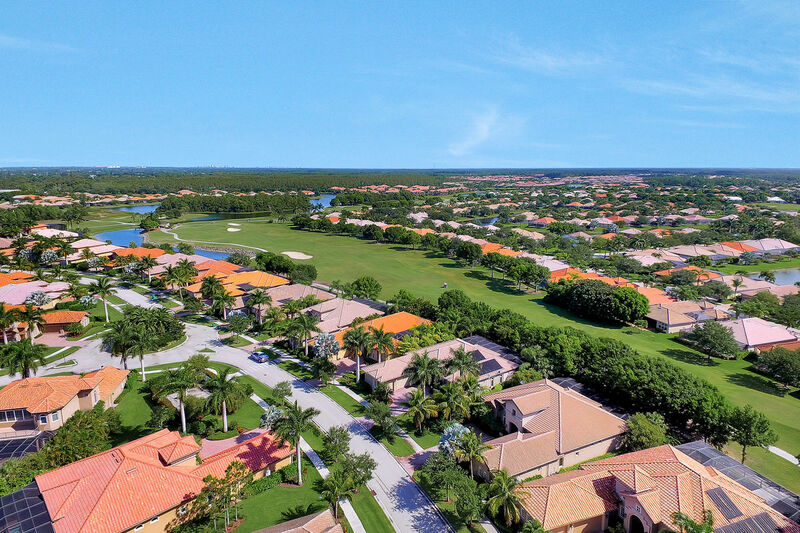 Enjoy some of the best golf in Naples right at home with access to the Mustang and Flamingo Island Golf courses. The Mustang course was designed by Lee Trevino. It is decorated with twelve lakes and has been rated 4 stars by Golf Digest Magazine. The Flamingo Island Golf Course is characterized by its sculpted shapes of topography which is a hallmark of course designer Robert Trent Jones, Sr.
You'll have the option to access to the newly remodeled and world-class 20,000 square foot Players Club & Spa – featuring amenities including a lap pool, waterfall, children’s water park, lighted tennis courts, bocce ball courts, fitness center, beautiful decks, sauna, spa, massage service, media room, theater room, billiards, restaurant, Tiki bar – and poolside waiter service. Please let us know if you are interested to take advantage of the Players Club & Spa amenties and we will be happy to walk you through the process to sign up. 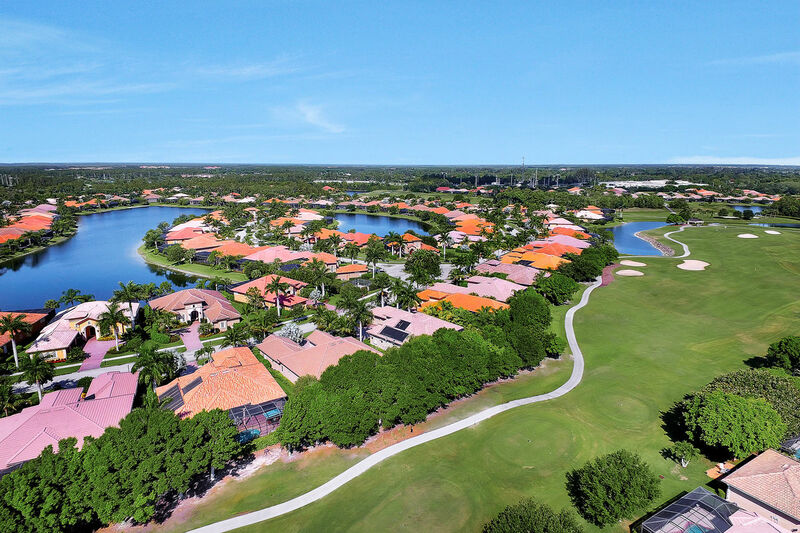 Naples Florida also known as ‘Florida’s Paradise Coast’ offers exquisite sunsets, incredible shopping, championship golf and white sandy beaches while being home to some of the most luxurious waterfront estates and condos in the world. It is a popular, sophisticated and charming beach destination located on the Gulf of Mexico with miles of white sandy beaches. The ocean surf is gentle and the people are friendly. Shoppers delight in searching for antiques, home furnishings, clothes and jewelry. With its beautiful neighborhoods and grand architecture; the atmosphere is elegant and relaxing. Sports enthusiasts spend glorious days pursuing their favorite activities including golf and tennis and we are also blessed with some of the best sport fishing in the world. There are many fine restaurants to suit every taste and budget. Even though it is a busy cosmopolitan city Naples is just a short adventure to secluded islands and the wilderness of The Florida Everglades. It was my family's and my absolute delight to stay in such a beautiful home. This child friendly house is exactly as the description says and so much more. 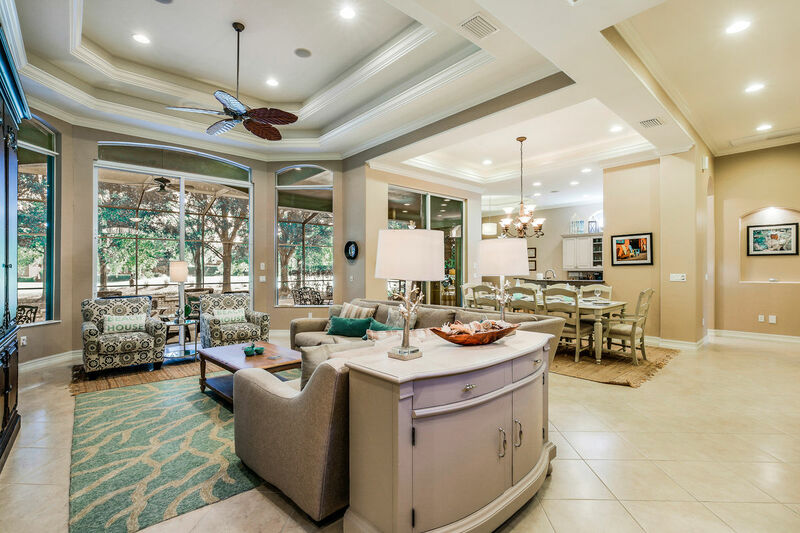 Every detail is luxurious and it is equipped with everything a family vacation needs, from a state of the art, gourmet kitchen, to bikes and board games. 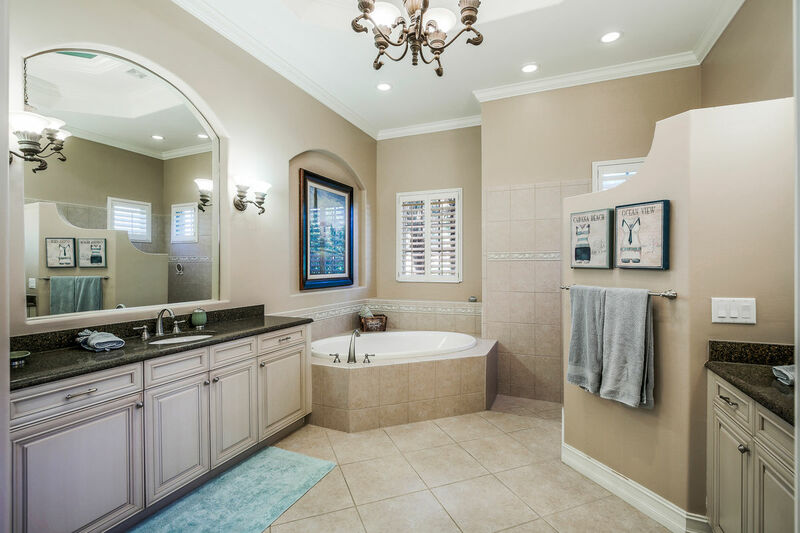 It was so relaxing to be in such a spacious home, with open floor plan living areas and beautifully updated bedrooms and bathrooms. Everything is refreshingly new and has been magnificently decorated with special attention to color and layout. The whole house is extremely clean and very well maintained, including the gardens, paint jobs, swimming pool and even the exterior of the house. 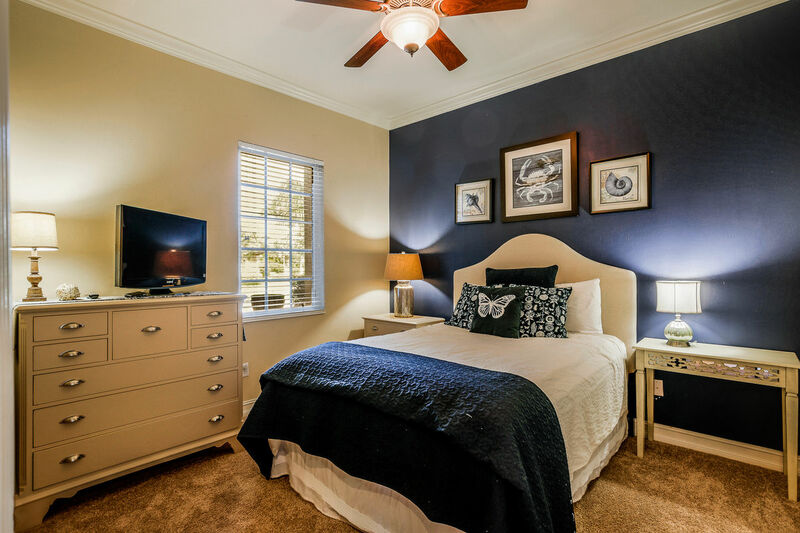 The majors is a peaceful, yet central neighborhood, just minutes from shops and restaurants. Close to Marco Island and also Naples Pier Beach. 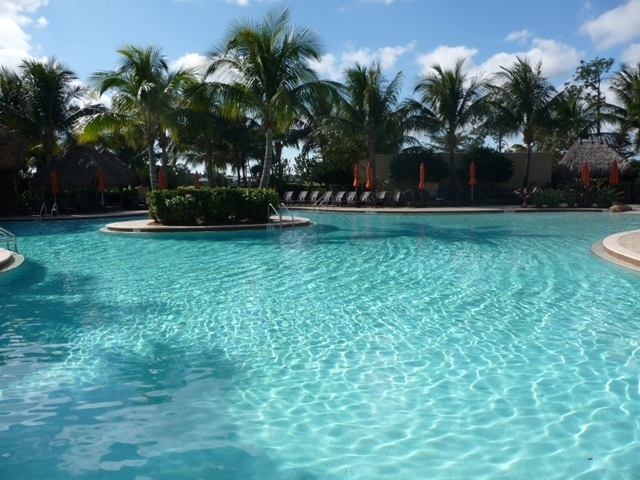 The Lely Resort Players Club and Spa, which offers the most amazing amenities, was one of our favorite places to hang out, swim, eat and play tennis. The owners are kind, lovely people and were so helpful and easy to work with. Being international tourists on vacation all the way from Australia, this house was a beloved home away from home for us and we were heart broken to leave it. I would most certainly recommend this property to all of my family and friends and plan to return as soon as possible. Family Sandivasci – Majors at Lely Resort. 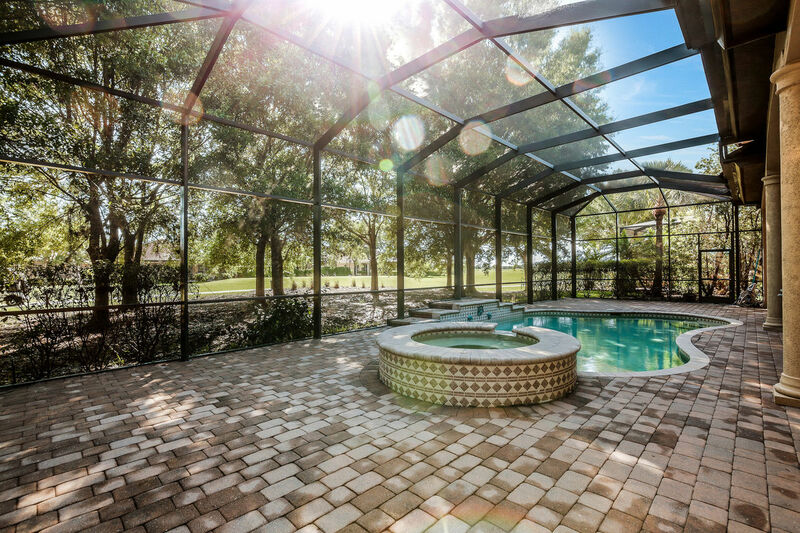 We had a wonderfully relaxing holiday at this fabulous home in Lely. The booking process was seamless and extremely efficient with fast, friendly and helpful advice from Marco Naples Vacation Rentals. 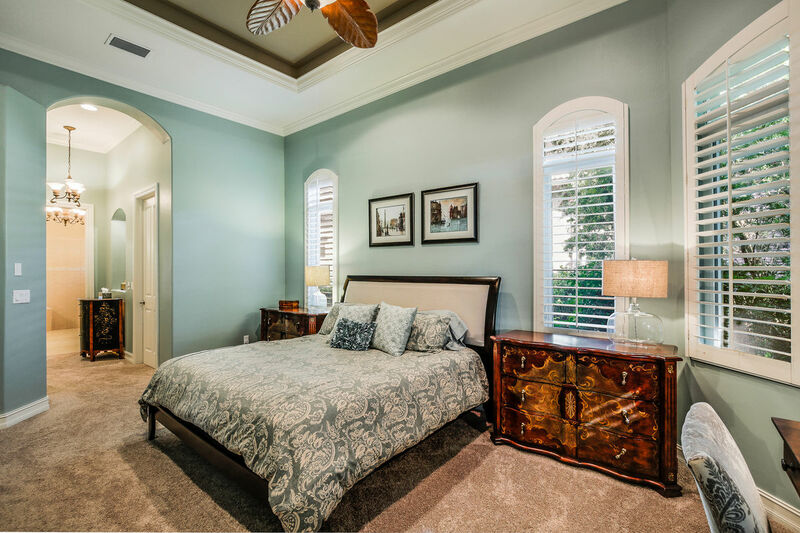 The home was luxuriously decorated and appointed to the highest specifications, and provided everything that we could ever need. We loved the home, and give our grateful thanks to both Marco Naples Vacation Rentals and, of course, the owners who allowed us to share their fabulous home which has given us so many cherished memories. We had a great time in this house. The furniture and decor are very nice! One of those beds is too soft for us and was not comfortable, however its was not a problem. We should recommend and I hope to get back soon. This beautiful and immaculate home is the perfect place to stay for your vacation. 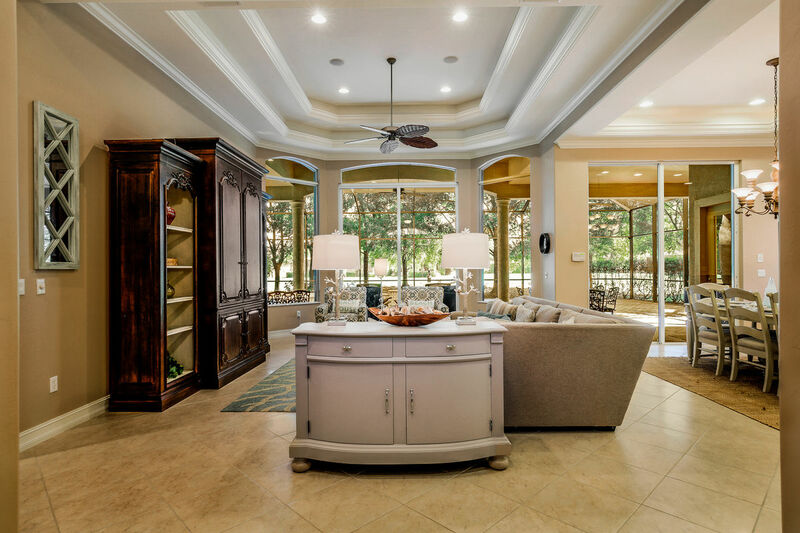 You will feel like you have walked into a designer model home. Everything you could ask for is here. Plenty of room and beautiful amenities. Customer service and satisfaction is a high priority for these owners. 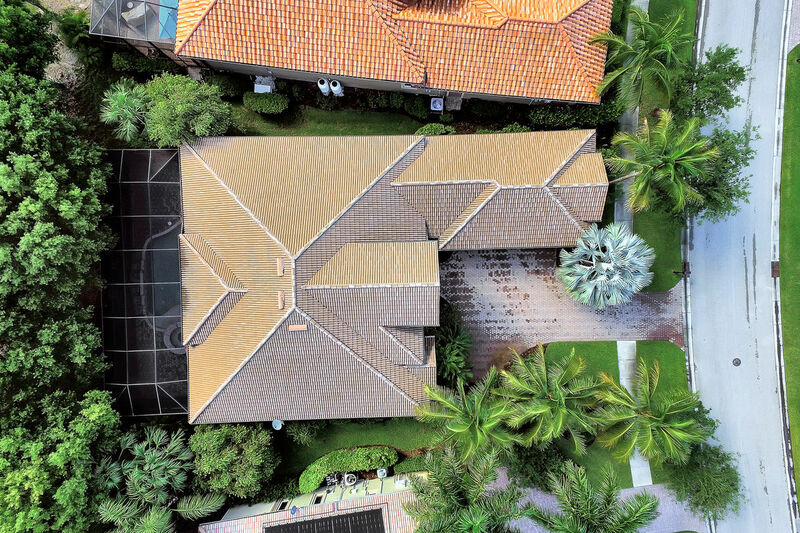 The home is conveniently located to downtown Naples and Marco Island; both offering beautiful beaches, fun activities, and wonderful restaurants. We will definitely be back! We will highly recommend this property to friends and family. Although this was not our first trip to Naples, it was our first stay at Lely and we picked the perfect house. We worked with Gisselle from Marco Naples Vacation Rentals and she was extremely helpful in getting us settled. The house was very spacious and clean. All of the furniture was comfortable and accommodated all seven of us. The best part was outdoor living. We were able to grill and enjoy our meals outside by the pool and hot tub. We will definitely make a return trip. This is the most beautiful villa we have ever had the pleasure of staying in. Not only is it stunning inside, it has everything required to make your stay perfect - even down to the beach chairs! 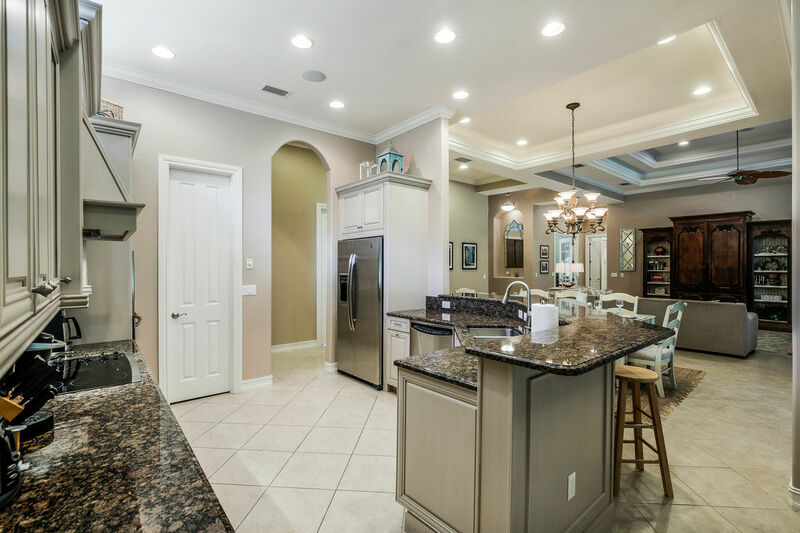 A big thank you to the owners for allowing us to share their beautiful home and also to Marco Naples Rentals who were such a friendly, professional company. I would highly recommend them. The description of the property is accurate, if anything it is understated. I was pleased to see that there were additional amenities. The house is beautifully furnished, I learned that the owner is an interior designer, all good.. The pool area was lovely, everything was clean and in good repair, important to me being a single grandmother. As an aside I also felt safe. The manager and the owner were solicitous of my comfort, and willing to do anything to assure that. Even though I did not need to call them, it was reassuring to know I could have. It is a wonderful family home, my grandchildren visited and said "Nana this is the best ever." There was so much for them to do within Lely. 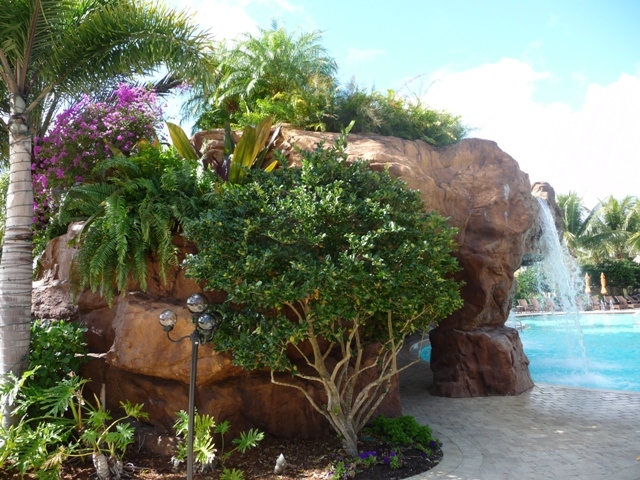 Lush landscaping, elegant decor, quiet charming neighborhood yet close to shopping, beaches, Everglades. We have been coming to Naples once a year for almost 10 years now. We have stayed at many houses in the Lely Resort area over that time. This one may have been the best one yet. The layout worked great for the 8 family members we had staying at the house. The house itself, including the pool and outdoor area were very nice. We were able to access the Player's Club and Spa as well. Really the house is a 3 bedroom, but they converted a den/office to a 4th bedroom. So, there is no closet in that bedroom, but the Master is right next door and we were able to share closet space that way, so it really wasn't a problem, especially for a week long stay. The house had all the kitchen appliances we needed. In the garage were bikes we could use along with a Ping Pong table. It was a very relaxing week and we barely felt the need to leave the house. We sometimes need a house with a 5th bedroom on our stays, but if we come in the future needing only a 4 bedroom house, this will definitely be my first request if it's available. Beautiful resort and lovely home. Felt very comfortable with our family. Felt right at home with room to spare. Paid for temporary membership to club and enjoyed all of the amenities. Would return! This is a beautiful home and it was the perfect place for our girls trip! The pool and lanai are to die for! The water features and setting are so tranquil! The home is very nicely decorated and it was clean enough to pass ever the toughest clean freaks muster, which is saying something! The kitchen is very well equipped, they had everything we needed and wanted. We each had our own bedroom. All were nicely decorated and comfortable. The person in the master did say that mattress could have more comfortable. There are a few very minor touch ups that could be made here or there, but I would highly recommend this home and hope to return some day! The rental company was great to work with too! Great house in an incredible area! The house was exactly like the pictures show. Plenty of room for the 7 of us. The pool and hot tub and lanai area were top notch. House felt real comfortable. The dryer wouldn't start one day, we called and they had a new one brought out the next day, we appreciated the quick turn around. We recently stayed at this home in late October 2017. The home is gorgeous and nicely appointed. This was the third rental in the last three years and it was the best so far. It was very clean and had a lovely lanai and pool. We would definitely stay here again. My only issue is the early check out...10 AM...beware of this. 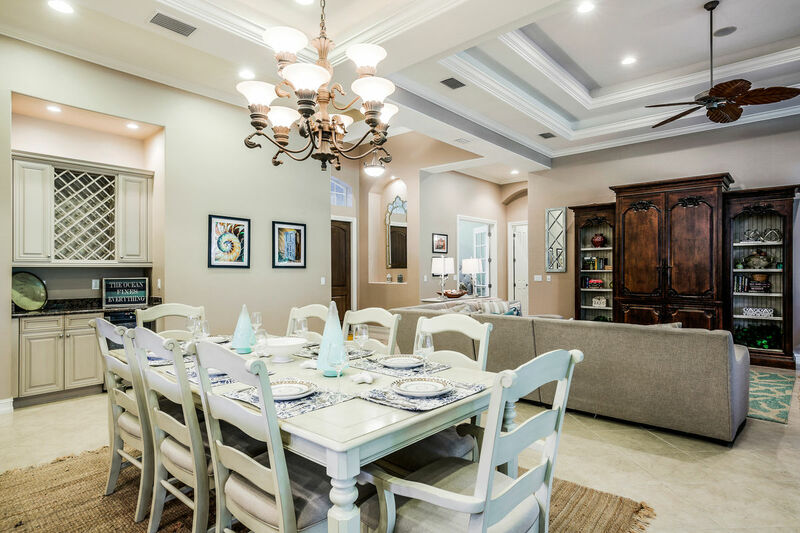 Beautiful and fresh house that easily accommodate a party of 6 -8. We and our grandparents had a marvelous time at Lely. We opted for the Club passes and this provided us with additional options for the kids. Ejoyed the happy hours as well as playing tennis and bocce at the club. Would recommend this alternative for a family that don't always find all the conveniences in a hotel. With easy access to a kitchen and laundry room, you are in full control, which we truly appreciated. We really enjoyed our time at this home. It was perfect for our family to celebrate Thanksgiving together. It is well furnished and we especially appreciate the additional baby items at the home. We will be back! We had such a relaxing and great time in this home. There were 5 adults and 2 children and space for everyone. The pool is great and we swam all day long. It was about a 20 - 30 minute drive to Marco Island and the beaches in Naples. We went to 3 different beaches and all were great. We were able to grill lunch and dinner and ate by the pool. The only recommendation we have would be to leave an extra roll of toilet paper or paper towel; you have to purchase everything you will need for your stay. In other homes we have rented there were always extra paper goods and some kitchen supplies left from previous renters. The resort was beautifully kept. The house was gorgeous and very clean. The resort was close enough to stores and places to eat. The information provided was perfect and there weren’t any issues with getting in and out of the gates. I would definitely recommend this resort. A great spacious and well equipped villa with more than enough room for 6 Adults , it is a homley property we all felt after a day out that we were coming home .I would recommend getting the pool heated and have the passes for the Players club and Spa .Location is great for exploring the Everglades and Naples area, we all had a fantastic time and did not want to leave . Great home for large family. We had another great week at this house-- perfect setup for our young daughter and extended family. We enjoyed the bikes, ping pong table, pool and hot tub. Great to have the outdoor grill and kitchen. Just a great setup at a nice house.